After a customer lost the installation scripts and setup files I had to reconstruct a part of the deployment for him. Luckily (for him) the servers where still running so they could continue working. It gave me the opportunity to get an overview of the installed components on the server, nice! 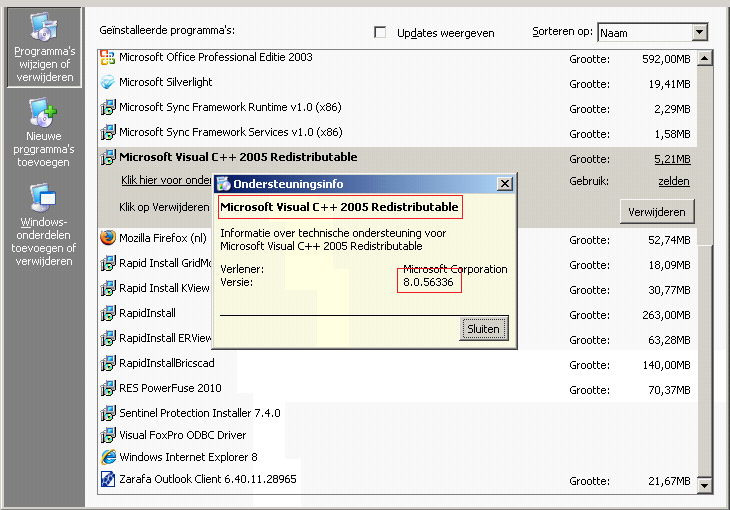 One of the components was the Microsoft Visual C++ 2005 Redistributable with version 8.0.56336 . A quick search on the internet resulted in a download at Microsoft (link). After installing the downloaded redistributable version 8.0.50727.42 was displayed. What’s that? It turned out that 8.0.56336 is actually Microsoft Visual C++ 2005 Redistributable SP1! Microsoft apparently didn’t find it necessary to add this to the application name, but it took me a while to find the correct download. This redistributable can be downloaded here.